Now we can add another name to the Bollywood-marries-Cricket list! The new ones to join the ranks are the Indian cricket team heart-throb Virat Kohli and B-town actress Anushka Sharma. Famously tight-lipped about their relationship, the duo succeeded in keeping everything under wraps until the news finally got out and they themselves shared the news with their fans. After years of being one of the Bollywood’s and cricket’s most loved couples, they tied the knot in an intimate ceremony in Tuscany. 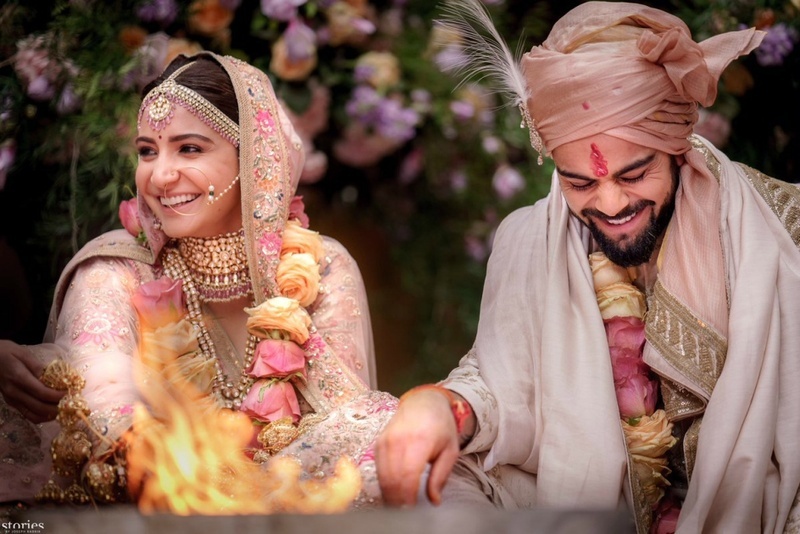 Before taking the saat pheras and vachans in Tuscany, Virushka exchanged the rings and committed to being with each other till death do them apart. Anushka looked ravishing in a custom Sabyasachi Gulkand Burgundy velvet saree with hand-embroidered miniature pearls and the finest quality zardosi and marori. She completed the look with a stunning uncut diamond and pearl choker with matching studs, kohl-rimmed eyes, red roses in the bun and her iconic micro dot bindi. Virat looked dapper in a three-piece navy-blue suit with a grey tie. For her mehendi, Anushka opted for a boho look, full of bright colours. She wore a Sabyasachi graphic lehenga in fuchsia pink and Indian orange, hand-printed by the famed Calcutta block printers and hand-embroidered with gota and marori. Anushka completed the look with earrings from the Sabyasachi Heritage Jewelry collection, custom made juttis in hand woven brocade and zardosi, natural day makeup and dash of pink on the lips. Virat too was spotted looking his stunning self in a khadi kurta-churidaar paired with fuchsia pink textured silk Nehru jacket. At the wedding, Anushka looked resplendent in a pale pink Sabyasachi lehenga with Renaissance embroidery in vintage English colours embellished with silver-gold metal thread, pearls and beads. Her bridal jewellery comprised of handcrafted syndicate uncut diamonds, pale pink spinel and baroque Japanese cultured pearls by the Sabyasachi Heritage Jewelry collection. She completed the bridal look with heavy jewelry, matching flowers in the bun, natural day makeup and the iconic mini bindi. Virat too made a stunning groom in an ivory raw silk sherwani hand-embroidered in a vintage Benarasi pattern, paired with an old Rose silk Kota safa and accessories by Sabyasachi. For those who feel like they’ve lost out on the live action from one of the most highly anticipated celebrity weddings of 2017, Sharma and Kohli will be returning to India to host a reception in New Delhi for their relatives on December 21 and in Mumbai on December 26 for Anushka's celebrity friends to join in along with the cricketers. After both receptions are over, the newlyweds plan to travel to South Africa to spend New Year’s Eve together. Following that Kohli will start prepping for the upcoming test series and Anushka will return to her shoot scheduled early in January.